Antony Ingram June 11, 2012 Comment Now! If you want a mix of performance, luxury and fuel efficiency, you're really limited to two choices. One is to pick one of the latest generation of powerful turbodiesel models from Mercedes-Benz or BMW. The other is to go down the hybrid route, with marques like Porsche, Infiniti, BMW, and of course Lexus, all offering (or set to offer) clean-burning gasoline-electric hybrids. 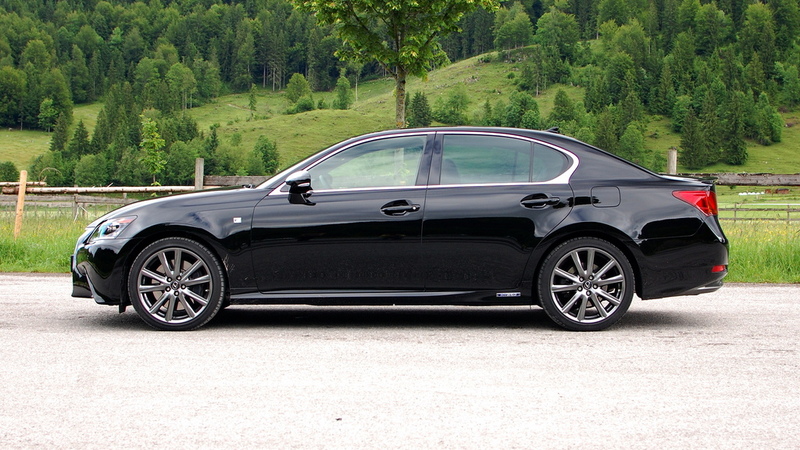 Lexus has revamped its GS line for this year and with it comes the new 2013 Lexus GS 450h. With more power, less weight, better gas mileage and more gadgets than ever before, the new GS 450h is ready for a fight. The first punch comes with the styling. In the words of GS Chief Engineer Yoshihiko Kanamori, "On the freeway in the old GS, I had to flash my lights to ask people to move out the way... in the new GS, other cars move straight away". Lexus' new 'L Finesse' design language certainly makes the new GS more aggressive before, that rear-view mirror presence enhanced by a chrome-accented 'Spindle' grille design. 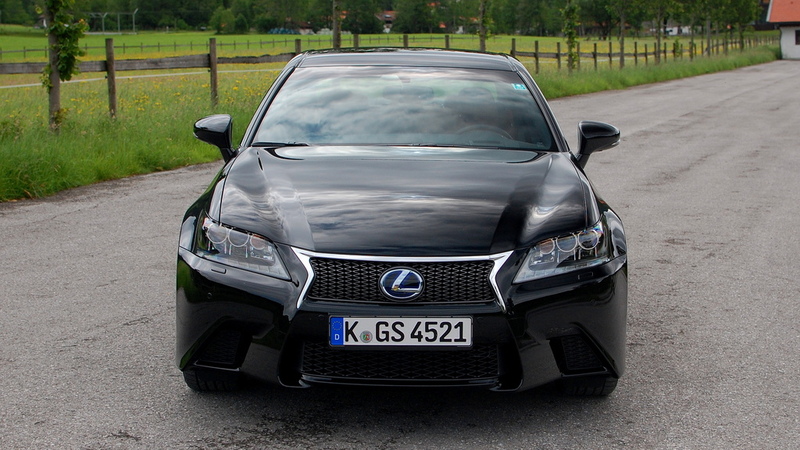 It flanks a mesh grille on the F Sport models, slatted on the rest. Arrowhead LED daytime running lights complete the look. The car's flanks are perhaps a little slab-sided from some angles, but 19-inch wheels on the F Sport minimize this, and with a drag coefficient of 0.27, it's certainly an effective shape. It's also a bit more characterful--we think the GS has finally found its own style, after a string of cars that seemed to uncomfortably crib from the German marques without having the same cohesion or style. 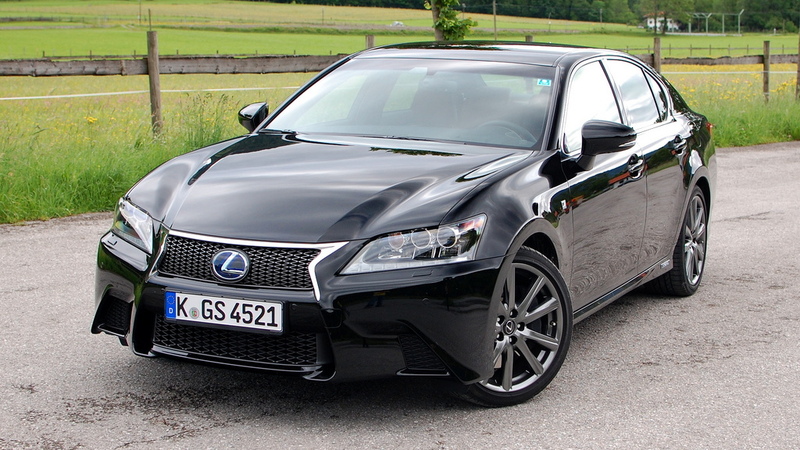 It's particularly striking in F Sport trim, which whets our appetite for the rumored GS F model. Inside the improvements continue, where the new GS shrugs off the blandness of old models. The center stack is dominated by the largest infotainment screen currently fitted in a production car, and a wide, horizontal element running across the cabin. In the center sits a tasteful analog clock, carved from solid aluminum billet. Finding the ideal driving position is a cinch, aided by multi-adjustable seats. These not only slide fore and aft, up and down and tilt, but on Luxury, Premier and F Sport trims, you get two levels of lumbar adjustment, further backrest adjustment, under-thigh support and a button to adjust the seat bolsters to hug you tighter in the corners. Naturally, the steering wheel also adjusts in every direction. Once ensconced, all the controls fall easily to hand, and with a new head-up display projected onto the windscreen, you'll not need to take your eyes off the road to determine your speed or view satellite-navigation directions. In fact, you'll barely ever use the normal dials, so easy is it to take a quick glance at the HUD. Thankfully, it's not just the front seat passengers that get to enjoy the interior. 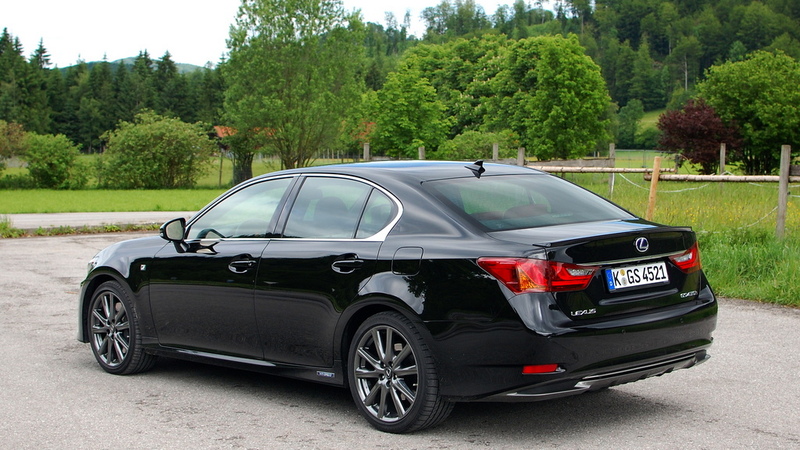 The GS is now suitable for four full-size adults, with more-than-adequate leg- and head-room in the back. The trunk over 50 percent bigger too, as the hybrid's batteries are now stacked vertically rather than horizontally, as before. Out on the road, the GS 450h continues to impress. Leaving Munich airport on our test drive, the first sixty miles of driving took in some of Germany's autobahns, including those with de-restricted sections. With the paraphrased mantra "When in Germany, do as the Germans" on our minds, we pushed pedal to carpet and felt the full combined 341 horsepower from the hybrid-assisted 3.5-liter V-6 do its thing. Ordinarily, continuously variable transmissions can be a little vexing, mooing away without much progress to show for all the noise. This certainly isn't the case in the 450h, which picks itself up and thrusts you towards the horizon. It doesn't take long to reach your chosen speed, at which point the revs die down again and leave you doing whisper-quiet triple-figure speeds. From rest, 60 mph arrives in 5.9 seconds, and top speed is electronically limited to 155 mph. The old GS was rarely out of its depth at highway speeds, so most of the new car's improvements can actually be appreciated when the going gets twisty. Our F Sport car was loaded with technology to improve cornering, including Variable Gear Ratio Steering, Dynamic Rear Steering, and Adaptive Variable Suspension. Combined, they conspire to make the F Sport feel nimble and responsive around Austria's twisty Alpine roads. Even selecting Sport mode--accompanied by a red glow from the instruments and the hybrid drive indicator being replaced by a tachometer--fails to upset the ride quality, but adds a useful extra dose of steering feel and firmer suspension. Perhaps the icing on the cake was our economy, following a mix of continued 30 to 60 mph driving conditions between towns, and a spirited drive through the Austrian Alps. EPA combined economy is 31 mpg, with 29 city, 34 highway. Our drive saw an average of 36.7 mpg, before 80-90 mph highway driving knocked it down to an overall average of 34 mpg. At those sort of speeds, the fuel display was showing gas mileage of around 27 mpg. That the car can be enjoyed as much as we did on Austria's picturesque roads and Germany's high-speed autobahns, but still achieve that sort of economy, is certainly something to be praised. 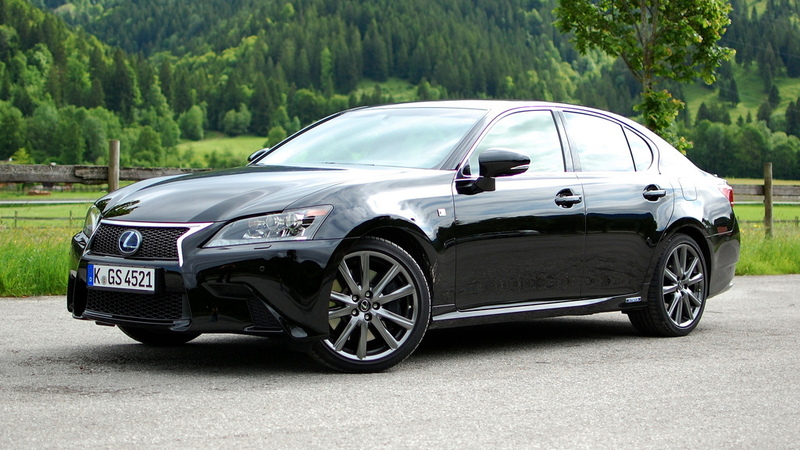 Priced from $58,950, the 2013 Lexus GS 450h is around $3,000 cheaper than the upcoming BMW ActiveHybrid 5-Series. It's also about $5,000 more than the 2012 Infiniti M35h, but gets better gas mileage and is a little easier on the eye. In reality, buyers in this market will choose based on badge preference, but in Europe at least Lexus is aiming for 60 percent conquest sales--i.e. sales stolen from other makers. That's an ambitious target in the German-biased European market, but in the U.S. we don't see the GS 450h having much trouble asserting itself as the top-selling luxury hybrid model. Performance is par for the class, real-world efficiency is excellent and it's a better car to drive, look at and sit in than its predecessor. If you're looking for that perfect mix of performance, luxury and fuel efficiency, you've just found it. Lexus provided airfare, lodging, and meals to enable High Gear Media to bring you this first-person drive report.